Before the invention of the refrigerator, most people were limited to seasonal foods or to those preserved by drying, salting or pickling. However, from the 17th. century, the rich and privileged increasingly built icehouses in the grounds of their large houses in the country, and occasionally actually within town houses to preserve food and provide ice for the table and especially to cool wine. In the 19th. century commercial icehouses were constructed to provide ice for general use, to stock private icehouses when supplies from the local pool were scarce and later to produce “frozen” food. 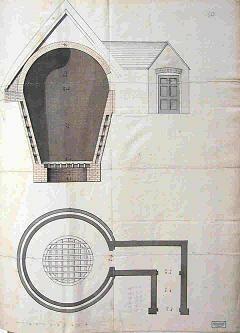 In the Midlands these commercial icehouses were often built near canals to allow easy transport. Over the years many icehouses have collapsed or been demolished. Others have been filled in or used for storage purposes, but of those that have survived, many have been conserved and opened to the public. The icehouse in Moseley Park was built in the late 18th or early 19th century, around the same time as the Moseley Dovecote and cow-house. 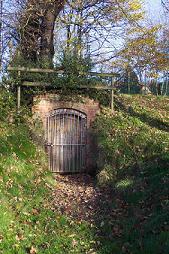 During the years since it was used for storing ice, it had been used to store shale for the Chantry Tennis Club and sundry garden implements. 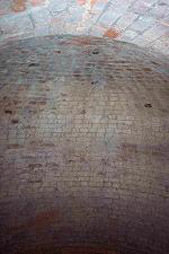 Following an initiative by the Moseley Society, the icehouse was cleared of debris and remedial work carried out to the brickwork. 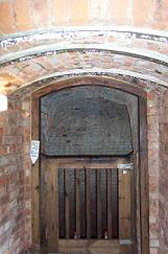 The Icehouse has now been restored and is open to the public on selected Sunday afternoons during the spring and summer months. Click HERE to see the opening dates of the Dovecote and Icehouse.